The old saying by Alfred, Lord Tennyson said, "Tis better to have loved and lost than never to have loved at all." For ATP World Tour No. 142, Thiemo de Bakker, the saying could be, "tis better to be a lucky loser than to have never been in the draw at all." De Bakker is making the most of his lucky loser opportunity at the BB&T Atlanta Open as he upset the No. 2 seed and world No. 17, Kevin Anderson, 6-4, 7-5 to advance to Friday quarterfinals, when he will take on another unseeded player in Benjamin Becker of Germany. De Bakker, a former top-40 player from Gravenzande, The Netherlands, has battled injury and erratic play over the past two years, but he's been happy with his play so far this week. When Anderson earned the first break of the second set and went up 4-2, de Bakker said that next game was a key game for him to win to stay in the match. "He's dangerous and you don't want to be down a break to a guy like him. ""I think I played really well," explained de Bakker, who was playing his fourth match of the week. "I tried to be aggressive, keep him moving, and I think I did well." While one of the top seeds fell on Thursday, the No. 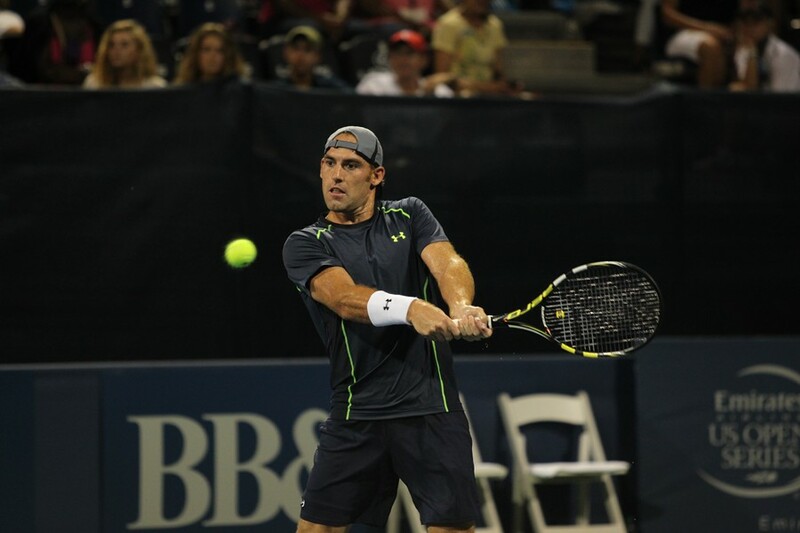 1 seed and defending champion, John Isner survived a scare from Marietta resident and veteran Robby Ginepri. Isner relied on his serve and forehand to eek out a 4-6, 7-6 (5), 7-5 win. The defending champ once again saved two match points in the deciding set, and broke serve when Ginepri netted a cross-court backhand in the eleventh game of the final set. Isner then slammed four straight aces to close out the match. The 6'10" Isner says the first match in any event is all about getting the rust off his game. "It's not easy, coming in playing your first match," said Isner. "Having a bye is nice, but at the same time you are playing someone that has played a match." Isner totaled 30 aces for the three-set match and only converted one break point chance, but it ended up being the only one he needed. The former Georgia Bulldog All-American next plays Marinko Matesevic. Matesevic outlasted American, Tim Smyczek 6-4, 7-5. The Australian served six aces and connected on 67 percent of his first serves in the 95-minute match. "He's good. He's good on fast courts," added Isner about his next opponent. "He's a little bit wacky and he would probably say the same thing as well. He's a character." In Thursday's other second-round match, Becker converted on 42 percent of his break point chances against seventh-seeded Yen-Hsun Lu, to take a 6-4, 6-3 decision in a match on the AJC Grandstand Court. The thirty-three-year-old Becker is having a good summer. He reached the finals of the ATP World Tour 250 event in ‘s-Hertogenbosch last month. Because of rain, only one doubles match was completed on Thursday. Jack Sock and Vasek Pospisil, the current Wimbledon champions, ousted the German pair of Becker and Frank Moser, 6-4, 6-1. All four singles quarterfinals will take place on Friday.